ISE USES INFRARED IMAGING FOR AN INSIDE VIEW OF WHAT'S REALLY GOING ON. In this comparison, the infrared photo on the left gives a clear view of possible failure causes for the component on the right. With a teardown avoided, the investigation can be resolved in a much shorter time. 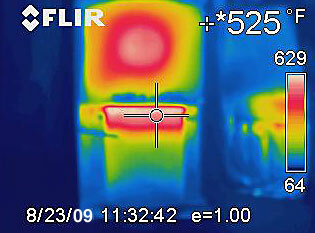 The infrared photo on the right clearly shows a heating pipe hidden in the walls. Without IR technology like this, exploratory cuts would be required to identify this leaking pipe as cause of the loss.